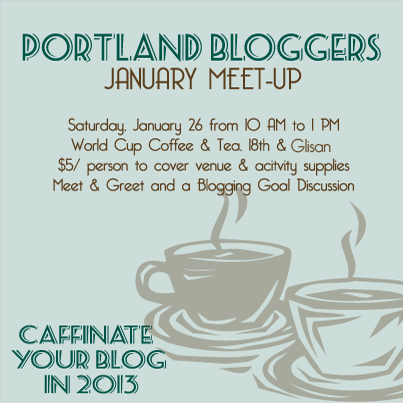 We hope you’ll join us for the first meet-up of the new year where we will spend some time getting to know each other, talking about the holidays over coffee, and working on goals for our blogs in 2013. Come with goals in mind or completely open to a world of blogging possibilities! Each blogger in attendance will leave with a blogging calendar/goal tracker/ meet-up tracker that will fit nicely into a 3-ring binder. A few other surprises might just be up our sleeves as well! Cost: $5/ person to cover the venue fee & materials– food & drink is NOT included this time, but is available at reasonable prices. PS. We are searching for giveaway/goodie bag sponsors for this and future events. Know anyone or wish to be a sponsor? Email jenni@awellcraftedparty.com or fill out this form and we will get back to you with all the sponsorship info! I am considering coming to this meet-up and have not been before. Do we bring the $5 with us or send it before hand? I’m so sorry, I can’t figure out where to RSVP. I look forward to meeting you all there. Could you e-mail me and let me know if you want me to RSVP and if so where? You may have even responded to the post above but I couldn’t find the response to that either. I’m so blonde! I’m so sorry! You are welcome to just paypal jenni@awellcraftedparty.com and put in the memo “Portland Bloggers” -or- we will just see you on Saturday and you can pay then! I hope to see you soon!